Interesting list! Here is my BTT. I forgot all about Dog in Good Omens, so funny. "Confuzzled" Shannon - Okay, I know what you mean. I haven't realy included the obvious ones like the 101 Dalmations (and I love them too! 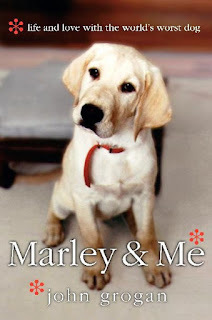 ), except for Marley! Clearly I need to reread Good Omen and need more Pratchett. I don't remember the hellhound at all. Cerberus or Kerberos has actually been around for some millenia. But Rowling has a tendency to borrow a lot from various mythologies. :) But liking soothing music and being called Fluffy are pretty unique additions. Love your list of dog stories. I must look for Dogsbody it sounds really cool. Many thanks for visiting my blog Unicorn's Last Stand today. Mervih - Well that's true, J. K Rowling does borrow a lot from mythology - in fact Cerberus was apparently put to sleep by music too! It's just that I like how she gives a personal touch to all that she does borrow!! Only Hagrid could have thought of calling that thing Fluffy! Nikki - Thanks for stopping by! Dogsbody is a really cool book.